The ‘fancies’ are the fleeting ideas, dreams and whims that flit like Will-o’-the-wisps through the imagination of every artist. I have always thought that they were captured to perfection by the Elizabethan poets and by their collaborators, the madrigal composers such as Weelkes, Wilbye and Morley; and, looking back now on the music heard on this recording, I realize how much of it was inspired by the madrigalian spirit. 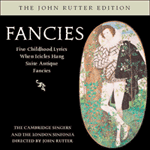 Fancies was written in 1971 for the Richard Hickox Singers and Orchestra (the orchestra was later renamed the City of London Sinfonia). The first performance was given in London, repeated shortly afterwards at an open-air concert one lovely summer’s evening by the River Thames in rural Berkshire, a perfect setting for it. Till ‘Cherry-ripe’ themselves do cry. And the cats cry mew, mew, mew. And still the cats cry mew, mew, mew. My masters all. Good day to you.